The CALLAHEAD Corporation introduces its latest portable toilet, the "CALLAHEAD Classic," which is a replica of an old fashioned outhouse. CALLAHEAD released this full service outdoor portable toilet with the most discriminating users of porta potties in mind. An elegant white colored portable toilet designed by CALLAHEAD to add a clean and classy look that is ideally suited for weddings or other formal or dressy events. On New York construction sites, one of the most common sights is the porta potty. As with most portable toilet companies, there aren't many options. However, CALLAHEAD has spent decades in the portable sanitation industry studying the needs of New York construction sites, and is now proud to offer another new innovative porta potty designed so that it is not only a portable toilet, but adds a whole lot more value to the construction site. From the beach to the job site to disaster relief locations, the CALLAHEAD Corporation provides New Yorkers with a refreshing, private hot shower when they need it the most, with their latest Portable Shower, "The ShowerHead 25". 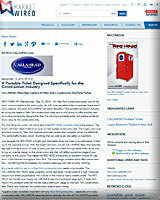 CALLAHEAD is known for always raising the bar in the portable restroom industry, and they are at it again. Forget the fireworks: This Fourth of July, CALLAHEAD is bringing red, white, and blue to portable toilet rentals across New York. Through their groundbreaking designs, meticulous attention to detail, impeccable cleaning service and creation of the most beautify portable toilets in the world, CALLAHEAD has created a line of July 4th portable toilets that leaves the competition in the dust. CALLAHEAD Corporation, New York's largest portable toilet company airs its nautical themed video intro. A video design by Charles W. Howard, CALLAHEAD President & CEO, is a masterpiece. It represents the very essence of Mr. Howard's inspiration of the company he built while raising the portable sanitation industry to a higher standard. From the outside, this wedding restroom trailer rental appears clean and crisp—it is stark white with wide floating staircases and a separate entrance and exit door for both the men’s and women’s facilities. But it’s when the door opens then guests will really be amazed. When creating the Versailles luxury restroom trailer, no detail was spared to ensure that every guest will feel like a member of the royal family upon entry. Immediately you'll be amazed by the spectacular sky ceiling mural epitomizing the opulence of the restrooms setting. The Gilded Age was alive and well in Newport, Rhode Island during the late 19th Century. Gilded Age mansions, such as the Rosecliff on Newport's 2 ½ miles long Bellevue Avenue encompasses more history and opulence than just about any other avenue in America. America's elite made Newport Rhode Island their summer home building opulent mansions they called, "summer cottages" with unobstructed views of the Atlantic Ocean. We owe an incredible debt of gratitude to the men and women who serve and have served in our United States Military. Our veterans and troops sacrifice so much, put their lives on the line, and too many have made the ultimate sacrifice to protect our American Freedom. CALLAHEAD, New York's innovative portable restroom company, has a new special event portable restroom to help us say, "thank you" to these American heroes. Modern Living with kathy ireland® Outlines the Changes in the Personal Sanitation Industry with CALLAHEAD Corp.
CALLAHEAD Corp., a company focused on portable sanitation solutions, is pleased to announce an exclusive interview with Modern Living with kathy ireland®. The interview, between Kimberly Howard, Vice President of Marketing for CALLAHEAD Corp, and Kathy Ireland, outlines the changes in the personal sanitation industry. Temporary events such as festivals, construction sites, and weddings rely on CALLAHEAD to provide sanitation equipment that can meet the needs of several people or thousands. George Washington's home is a National Historic Landmark located on the banks of the Potomac River near Alexandria, Virginia. 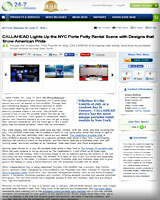 Famously known as the Mount Vernon Estate, CALLAHEAD, New York's largest portable restroom company takes Washington's home as its namesake for their latest special event luxury restroom trailer. The Mount Vernon Luxury Restroom Trailer's traditional 18th-century design will have you feel as though you entered a colonial building of the 1700's. Just about everyone has used a portable toilet when nature calls, however, taking a shower inside a portable bathroom is not as common. CALLAHEAD Corporation, the pioneers in portable sanitation, is changing the world in their industry. The WATERFALL SHOWER HEAD, the newest creation by Charles W. Howard, CALLLAHEAD'S President, and CEO, turns portable showering into a home-style private bathroom experience. Mr. Howard has been advancing the industry since CALLAHEAD began in 1976. CALLAHEAD manufactures the WATERFALL SHOWER HEAD making it the only one of its kind. CALLAHEAD, New York's top porta potty company, is proud to announce the Pink Ribbon Restroom in support of breast cancer research and awareness. Charles W. Howard, President and CEO of CALLAHEAD created the Pink Ribbon Restroom in support of breast cancer research and awareness. With every Pink Ribbon Restroom rental, CALLAHEAD will donate 20% of all proceeds to breast cancer charities. CALLAHEAD, "Best in Show" in the portable restroom industry will be providing their exclusively designed luxury restroom trailers, and portable toilets to the Westminster Dog Show held this year beginning February 11th in New York. Westminster has become "America's Dog Show" where judges decide which dogs best represent their breeds, and on the last evening, which dog is "Best in Show." Portable toilets are everywhere throughout New York. Porta potties are not only a convenience for construction sites, parking lots, parks, airports, lumber yards and emergency locations, but a necessity. With such high demand for portable toilets, for both businesses and special events, it is no wonder the masters of the portable sanitation industry, CALLAHEAD, has created another breakthrough product to their long list of restroom options. The U.S. Open Tennis Tournament kicked off on Monday, August 29th at the USTA Billie Jean King National Tennis Center in Flushing Meadows, Queens. This is the last grand slam tennis tournament of the year anticipating seven hundred thousand fans during the exciting two-week event. CALLAHEAD, New York's largest portable restroom company, has been entrusted to supply their luxury restroom trailers for the event. 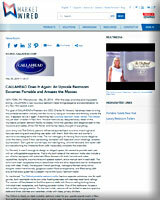 CALLAHEAD'S newest addition to their extensive list of products is one for the record books. Mr. Howard's state-of-the-art portable restroom called The Headrest is unlike anything ever created in the portable toilet industry. Between The Headrest's operating system, and the interior and structural design, users will not believe The Headrest is a portable toilet. CALLAHEAD will be providing a tremendous service to the horse racing community this year. CALLAHEAD, led by President and CEO Charles W. Howard are supplying eight of Mr. Howard's personally designed luxury restroom trailers and 175 newly designed special event portable toilets for The Belmont Stakes. It makes complete sense - The Belmont Stakes is one of the world's biggest horse races to call upon CALLAHEAD, the world's greatest portable restroom company. A Seashore Lifestyle in the Rockaways Influences the World's Greatest Portable Sanitation Company, CALLAHEAD, to create the Elegant Restroom Trailer, "The Atlantic"
Inspired by a coastal upbringing, CALLAHEAD's CEO designed The Atlantic luxury restroom trailer to bring back the opulence and grandeur from the bygone era while offering all the amenities of a five-star resort. With stunning silver, white, and navy blue tones seen throughout, The Atlantic 16-foot luxury restroom trailer portrays the beauty of the beach with sophistication and opulence. It is no surprise to learn that President and CEO of CALLAHEAD, Charles W. Howard, has designed another incredible product for the portable sanitation industry. Let's face it, Mr. Howard and the CALLAHEAD team has raised the bar to the highest level. From creating the most sought after portable restrooms and guard booths to the best sanitary cleaning service in the industry. CALLAHEAD'S newest luxury restroom trailer, the Soho, takes an otherwise ordinary restroom and transformed it into a trendy facility that looks like it belongs in an upscale boutique in lower Manhattan. When you search for Restroom Trailers New York, The SOHO should definitely be on your short list for consideration. Everything about this restroom is flawless. From the Cambridge's bright white exterior that looks crisp and clean in any location. To the opulence and extravagance that comes alive once you open the Cambridge's doors. The combination of basket-weave mahogany trim work, the diamond-cut crystal door knobs to the abundant ornate details assembled by Mr. Howard, will leave every guest in awe. With its included steel lifting hoist, exterior reflectors, bright orange color, and generous amenities, the Safety Head porta potty, offered exclusively by CALLAHEAD, is like nothing anyone has ever seen on highway, bridge and road construction sites. The steel lifting hoist included with this New York portable toilet rental was designed so a crane can effortlessly connect to it, and safely transport the Safety Head port a potty to its desired location. The Regency is a New York luxury portable bathroom trailer that has a shiny bright white exterior that crisp, clean and elegant. The two wide floating sturdy staircases (one for the men’s side and another for the women’s) are equipped with stair lighting convenient for evening events as well as stainless steel handrails for safety. Just like CALLAHEAD's other luxury restroom trailer rentals in New York, the Equestrian is equipped with both a men's and women's restroom, each with its own entrance and separate designated exit. This opulent restroom trailer is completely self-contained and able to provide bathroom services for hundreds of guests for multiple-hour events. With first-class amenities and impeccable styling, CALLAHEAD's new luxurious restroom trailer brings elegance and sophistication to any New York special event. Upon entry into The Oxford Luxury Restroom Trailer, patrons will be transported back to a time where high-end features were king and everything was laden with charm. This winter has been a tough one for New York, so it’s no surprise that springtime is being welcomed with open arms. The city is abuzz with talk of all of the outdoor activities being planned, with no detail being forgotten. However, one part of an open-air event that is often overlooked is where the guests are going to use the restroom. This is where CALLAHEAD steps up to the plate with the bat swinging. 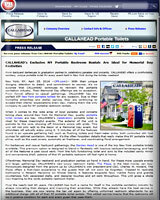 From backyard barbecues to graduation parties to celebratory parades and concerts, CALLAHEAD offers a comfortable, sanitary, unique portable toilet for every event held in New York during the holiday weekend. With their unique designs, attention to detail, and commitment to service, it’s no surprise that CALLAHEAD continues to reinvent the portable sanitation industry. CALLAHEAD has been an innovator in the portable sanitation world for almost four decades, and they never cease to amaze with their features and designs. However, 'The Plaza' Luxury Restroom Trailer may be one of their most impressive offerings yet. When guests enter this gorgeous 26-foot trailer, they will be transported to a washroom that could very well be seen in one of the Newport Mansions in Rhode Island. 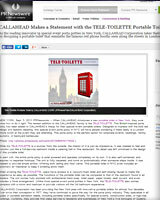 The newest addition to the CALLAHEAD family is the TELE-TOILETTE. This British-inspired porta potty has been added to CALLAHEAD's lineup for their special event portable toilets. Designed to impress with the bold red design and realistic detailing, this special event porta potty in NYC will have people wondering if there really is a London phone booth at the event they are attending. CALLAHEAD Corp., a leading innovator in the portable sanitation market in New York City, announces the introduction of the PURPLE POTTY, a product designed specifically for children. With this addition to their lineup, they have the ideal portable toilet solution for those planning children's events. In 1986, Charles W. Howard, President and CEO of CALLAHEAD, invented a ground breaking system he named the Portable Water and Sewer System. CALLAHEAD has now released the blueprints of this dynamic invention on their company’s website for all to read. 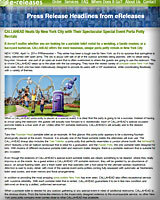 CALLAHEAD releases yet again another brand new porta potty rental for New York’s special events. The portable toilet is designed with the American flag colors of red, white and blue, to add a patriotic touch to any party or social gathering’s decor. Porta Potty Company, CALLAHEAD, Unveils First Gravity-Fed, Aluminum Body Portable Toilet in the U.S. The Callahead Corporation unveils the first ever, gravity-fed portable toilet in the United States. The HEADMASTER has 1/4" thick circular aluminum walls for superior strength, electric heating, as well as air conditioning. Charles W. Howard provides insight into the importance of consistency in business, and how quality goes hand in hand with it when developing a successful business model. CALLAHEAD’s Head Lines has been created so you may stay informed of interesting new developments regarding all of our products and services. For nearly four decades, we have been the leader in providing portable sanitation equipment to the construction industry and for special events throughout New York. Through all of our years in business, we have continually developed new and innovative equipment unavailable anywhere else. Our equipment is known to have changed the portable toilet industry forever. These Head Lines will be sure to keep you well up-to-date of all of CALLAHEAD’s revolutionary equipment, services and press releases. At CALLAHEAD, it is our commitment to consistently provide our customers with the highest quality service and products. We also believe providing detailed information about our company, equipment and service are a key to consumer confidence. Our Head Lines will be updated regularly so you will always stay informed. Information that will certainly give you the assurance that when you have CALLAHEAD, you have the best! CALLAHEAD has the widest variety of rental products with porta potties of every description along with other portable sanitation equipment which includes: portable toilets, special event portable toilets, handicap portable toilets, high-rise portable toilets, portable toilets on wheels, porcelain toilet systems, portable security guard sheds and guard booths, portable sink systems, antiseptic stands, restroom trailers, luxury restroom trailers, holding tanks, portable water and sewer systems, fresh water delivery, fuel oil delivery, comfort stations and portable storage sheds.